Striped dolphins are recognizable by their striking markings, making them one of the most beautiful small cetaceans. They are found in the Pacific, Indian and Atlantic Oceans and most adjacent seas, in waters roughly between latitudes of 50° North and 40° South. 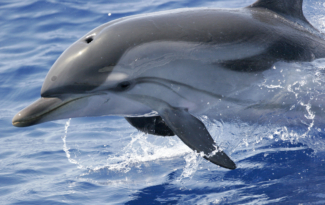 They are one of the most commonly encountered dolphins in the Mediterranean Sea. They are not always approachable, but when they can be observed, they are appreciated for their impressive acrobatic behavior. From a distance striped dolphins could be confused with other smallish long-beaked dolphins, including pantropical spotted, spinner and common dolphins. However, at close range the unique colour pattern of this species, marked by the distinctive interrupted cape and stripes between the eye and flipper and tail stock should make it easy to distinguish. It also has a slightly more robust or stocky build than the other species. Striped dolphins are found in the Pacific, Indian, and Atlantic Oceans and many of the adjacent seas, including the Mediterranean. They range further into temperate waters than spinner, spotted, or clymene dolphins, and are generally found between latitudes of 50° North and 40° South, although there are some unusual extra-limital records from areas further north. Like spinner and spotted dolphins, they are mostly observed in open oceans, except where deep water can be found close to shore. 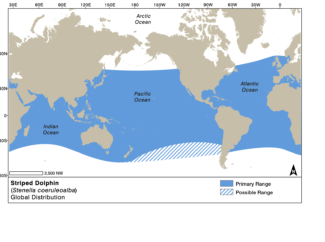 They are also associated with areas of upwelling of cold, nutrient-rich water1,2. Striped dolphin off the coast of Spain. Photo courtesy of Chris Johnson. Striped dolphins in different regions have developed different diets: Off the coasts of Japan, South Africa and in the in the northeast Atlantic, they feed predominantly on on lantern fish, a species that follows the diel migration to deep waters during the day and rises towards th surface at night. 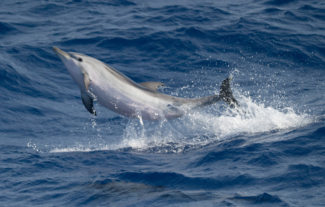 In order to reach this deep prey, striped dolphins are able to dive to depths of between 200 and 700m. 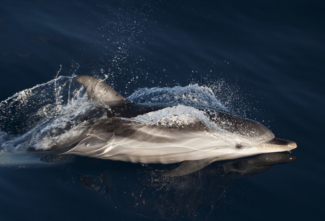 In coastal areas of the northeast Atlantic, striped dolphins feed on cod and anchovy, while in the Mediterranean they appear to prefer squid2,3. Striped dolphins can form groups ranging from fewer than 30 animals to 500, and are sometimes seen in association with other species in mixed species groups of over 1000 animals. In some ocean basins they form schools that are segregated by age class, with separate schools for juveniles, adults and mixed schools4. The adult and mixed schools are further split into those that are breeding or not, with one male likely breeding with multiple females. A female is pregnant for 12-13 months, and there appear to be two times of year when births are most common – one in summer and one in winter2. Striped dolphin off the coast of Greece. Photo courtesy of Chris Johnson. Killer whales and sharks are known to prey on striped dolphins. The species has also experienced mass die offs due to morbillivirus breakout in the Atlantic Ocean and Mediterranean Sea3,5-7. Like almost all small cetaceans the world over, striped dolphins are seriously impacted by entanglement in different types of fishing gear throughout their range, and fisheries bycatch has been high and potentially unsustainable in the northeast Atlantic8 and the Mediterranean, among other places3. Striped dolphins have also been the victims of several mass die-offs caused by a virus called morbillivirus3,7,9. Researchers believe that high levels of contaminants and other environmental factors somehow render this species more susceptible to viral infections3,10-12. There have been some directed hunts for striped dolphins in different locations, including Japan, where thousands of individuals were taken through the 1980’s. But current takes are now limited to fewer than 100 individuals per year13. The species has also been directly hunted either as food or because they were perceived as competition in fisheries in the Caribbean, Sri Lanka, and the Mediterranean5,13. Despite the ongoing threats and repeated mass die-offs, striped dolphins are numerous throughout their range and are designated globally as Least Concern on the IUCN Red List of Endangered Species13. The Mediterranean population, on the other hand, suffered severe depletion from a morbillivirus die-off in 1990-199214, and does not appear to be recovering, possibly due to ongoing threats of contaminants15 and fisheries bycatch3,16. As such, the species is considered Vulnerable on the IUCN Red List of Threatened Species5 The species is listed under Appendix II of the Convention on Migratory Species (CMS). Striped dolphins off the coast of Fujairah, United Arab Emirates. Photo courtesy of Robert Baldwin, Fujairah Whale and Dolphin Research Project. Due to their predominantly offshore distribution, striped dolphins are not often the primary target of whale and dolphin watching tours. 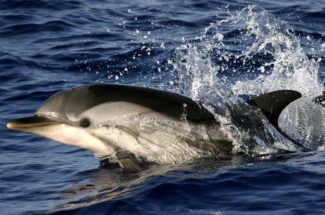 However, they are one of the most frequently encountered small cetacean in the Mediterranean (for example, Spain, Italy and Greece)17 and can also be observed on tours in locations where there is deep water close to shore, such as the Canary Islands and the Azores. 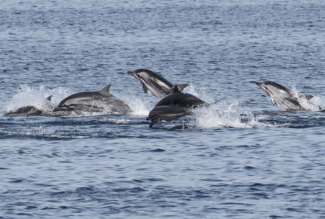 Different populations appear to react differently to boats, with some fleeing at high speeds – putting on a spectacle of leaps as they go, and others approaching vessels to bow ride18. Groups that can be approached sometimes put on impressive displays with leaps and a unique behaviour called ‘roto-tailing’, during which they twist their tail as they leap high out of the water2. 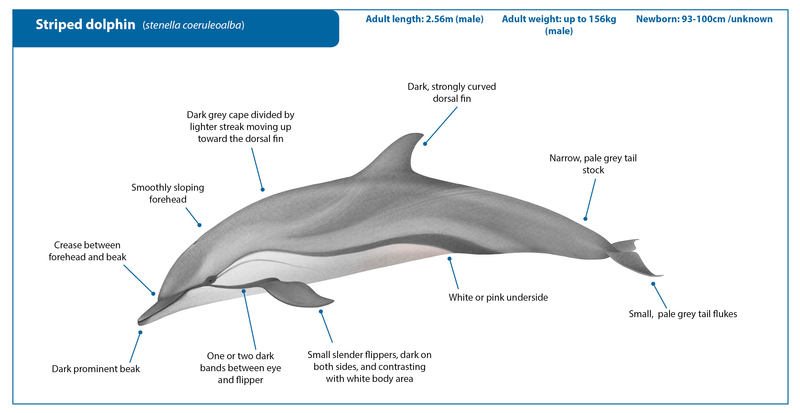 Archer, F.I., Striped dolphin, Stenella coeruleoalba, in Encyclopedia of Marine Mammals, W. Perrin, B. Wursig, and J.G.M. Thewissen, Editors. 2009, Elsevier: San Francisco. p. 1127-1129. Aguilar, A., Population biology, conservation threats and status of Mediterranean striped dolphins (Stenella coeruleoalba). J. Cetacean Res. Manag., 2000. 2(1): p. 17-26. Miyazaki, N. and M. Nishiwaki, School structure of the striped dolphin off the Pacific coast of Japan. Scientific Reports of the Whales Research Institute, Tokyo, 1978. 30: p. 65-115. Aguilar, A. and S. Gaspari, Stenella coeruleoalba Mediterranean subpopulation, in The IUCN Red List of Threatened Species. 2012, http://www.iucnredlist.org/det... Consulted October 2017. Duignan, P.J., et al., Morbillivirus infection in bottlenose dolphins: evidence for recurrent epizootics in the western Atlantic and Gulf of Mexico. Marine Mammal Science, 1996. 12(4): p. 499-515. Raga, J.-A., et al., Dolphin morbillivirus epizootic resurgence, Mediterranean Sea. Emerging Infectious Diseases, 2008. 14(3): p. 471-473. Woodley, T.H., Potential effects of driftnet fisheries for Albacore Tuna (Thunnus alalunga) on populations of Striped (Stenella coeruleoalba) and Common (Delphinus delphis) dolphins from the northeast Atlantic 1993(93-02 ): p. 1-13. Duignan, P.J., et al., Morbillivirus infection in cetaceans of the western Atlantic. Veterinary Microbiology, 1995. 44(2-4): p. 241-249. Irwin, L.-J., Marine Toxins: Adverse Health Effects and Biomonitoring with Resident Coastal Dolphins. Aquatic Mammals, 2005. 31(2): p. 195-225. Van Bressem, M.-F., et al., Emerging infectious diseases in cetaceans worldwide and the possible role of environmental stressors. Diseases of Aquatic Organisms, 2009. 86: p. 143–157. Van Bressem, M.-F., et al., An insight into the epidemiology of dolphin morbillivirus worldwide Veterinary Microbiology, 2001(81 ): p. 287-304. Hammond, P.S., et al., Stenella coeruleoalba in The IUCN Red List of Threatened Species. 2008, http://www.iucnredlist.org/det... Consulted October 2017. Aguilar, A., Population biology, conservation threats and status of Mediterranean striped dolphins (Stenella coeruleoalba). Journal of Cetacean Research and Management, 2000. 2(1): p. 17-26. Pompe-Gotal, J., et al., Mercury concentrations in the tissues of bottlenose dolphins (Tursiops truncatus) and striped dolphins (Stenella coeruloalba) stranded on the Croatian Adriatic coast. Veterinarni Medicina, 2009. 54: p. 598-604. Di Natale, A. and G. Notobartolo-di-Sciara, A review of the passive fishing nets and trap fisheries in the Mediterranean Sea and of the cetacean bycatch, in Gillnets and Cetaceans, W.F. Perrin, G. Donovan, P., and J. Barlow, Editors. 1994, Report to the International Whaling Commission: Cambridge, U.K. p. 189-202. Azzellino, A., et al., Habitat use and preferences of cetaceans along the continental slope and the adjacent pelagic waters in the western Ligurian Sea. Deep-Sea Research Part I, 2008. 55: p. 296-323.